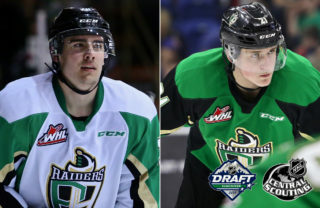 Prince Albert, SK – Two Prince Albert Raiders found their names on NHL Central Scouting’s midterm rankings, which were released on Monday morning. Brett Leason was ranked 17th among North American skaters, while Aliaksei Protas came in at 77th in the same category. 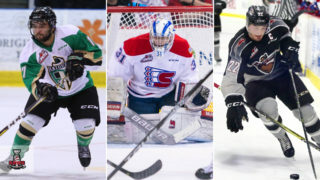 Both players were left off NHL Central Scouting’s Players to Watch list at the beginning of the year, but were included in November’s list as potential fourth-to-sixth round draft picks. Leason is having a career year for the Raiders with 31 goals and 42 assists in 39 games played this season, already setting new highs in all offensive categories. 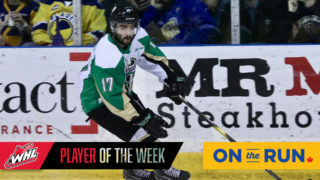 The Calgary product has received recognition as a two-time WHL On the Run Player of the Week, two-time WHL McSweeney’s Player of the Month, and a CHL Player of the Week. Earlier this season, the 6’4, 199-lb winger was a member of Team WHL at the CIBC Canada Russia Series. He assisted on the game-winning goal in Team WHL’s lone win of the event. Protas was selected 26th overall in June’s CHL Import Draft. In 39 games this year, the Vitebsk, Belarus product has nine goals and 20 assists. 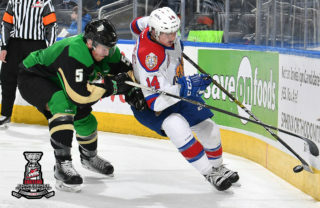 The 6’5, 192-lb forward suited up for Belarus at the 2019 IIHF U20 World Championship Division 1 tournament in December. Protas picked up a pair of goals and three assists as Belarus finished second in the round-robin format. Team Belarus took down France 6-2 at the World Junior Division 1 Championship earlier today. 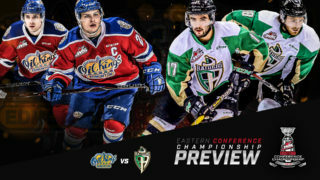 Leason will take part in the 2019 Sherwin-Williams CHL/NHL Top Prospects Game in Red Deer on Wednesday night as part of Head Coach Marc Habscheid’s Team Orr. 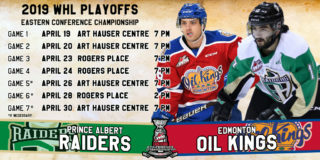 Catch the game on Sportsnet at 9 p.m. CST.